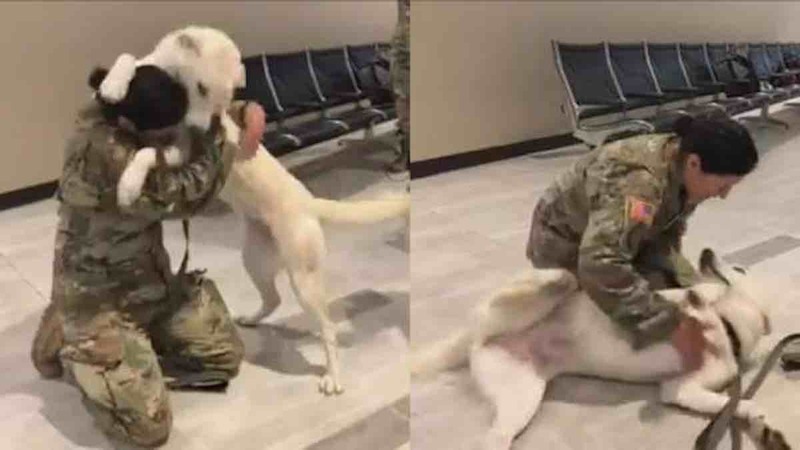 This American soldier was so excited to be reunited with the dog she rescued, it took her a minute to actually greet her patiently waiting husband. To be fair, however, it has been seven months since U.S. Army Reserve Sgt. Tracy McKithern last saw Erby the dog. McKithern says that she first met Erby when she was deployed in Iraq back in 2017. The puppy and her mother, both of which were clearly hungry and abused, had been wandering the streets looking for food when they arrived at McKithern’s military base. The sergeant named her “Erby” after Erbil, the Iraqi city in which they were stationed. McKithern, along with soldiers from the Italian and German military units, fed the homeless dogs and looked after them until they finally put on some weight. Whenever the soldiers went out on missions, Erby would be waiting for them at the base upon their return. Friends and family rose to the occasion and sent her links to rescue organizations that could help bring Erby to America. One such nonprofit, Puppy Rescue Mission, immediately offered to help. After encouraging strangers to donate over $3,500 for the vaccinations and travel expenses, Erby was finally ready to join McKithern at her home in St. Petersburg, Florida. McKithern was initially worried that she would be sent home before she could complete all the paperwork, but her German and Italian friends in Iraq vowed to finish the process so Erby could be sent to America. Erby technically arrived in America two months ago, but she arrived at JFK airport the very same day that McKithern was sent on another deployment for two months in Wisconsin. Finally, the pup and her owner were reunited at Tampa Bay International Airport last week – and the meeting was a sweet one. Erby’s mom is still being taken care of by the soldiers in Iraq, but McKithern is optimistic about the canine soon being adopted and brought to America.